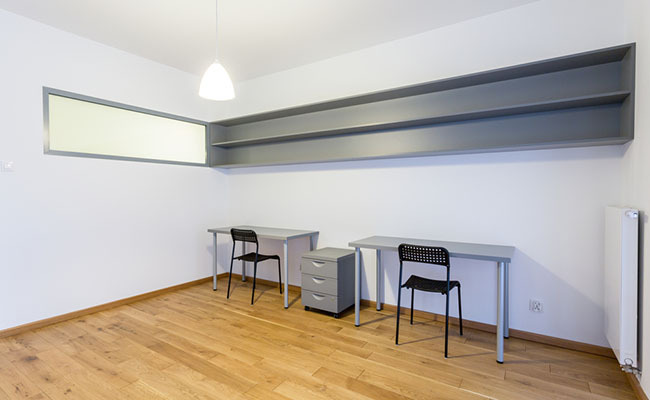 Should You Rent or Buy Your Small Business Office Space? The Pros and Cons - iSmallBusiness.com - Small Business Stuff That Matters...Pass It On! If you’re thinking about whether to lease or buy your office space, there are some factors to consider weighing the pros and cons of both decisions. Changes in many accounting standards may potentially make leasing office space a liability, but you have the flexibility to lease on short-term durations. On the other hand, interest rates are at historical lows, and many prefer to buy office space to give them the equity. If you’re considering buying a building you would be able to build equity and potentially, lease space to other tenant, but you would also be looking at long-term financing and upkeep costs out of your own pocket. If you lease office space, you’ll most likely have more cash liquidity, as your lease costs will be fixed and your CAM fees, or common area maintenance fees, will likely be fixed or fairly predictable as well. This can make the financial planning for your business much easier than owning, where any unexpected repairs or vacancies will fall under your P&L and responsibility. If your small business is fairly new, you will likely want to consider starting with leasing for the first two to five years of business as you figure out your business incomes, cycles and can more accurately predict your ability to handle a mortgage vs. a lease. Leasing office space can also allow you to focus on operating and expanding your business, vs. land lording. One of the negative aspects of leasing commercial property for your expanding business is that you are building equity for someone else, vs. growing your own equity in a property. While having a mortgage is a big responsibility, it also provides you with a potential alternative income source from other tenant’s rental income. When you lease, you simple don’t earn that equity. Another potential headache of leasing is fluctuations in rents and CAM fees if you have a landlord that is disorganized or not good. Property management can also be an issue, if you have problems or conflicts with other leasing tenants, you’ll have less control over who your landlord puts into the building, any parking infractions or other issues like noise or clientele. Be sure if you decide to lease that you iron out specifics about your rights as a tenant when it comes to other tenants in the building, too. When you buy office space for your small business, your mortgage payments are fixed which in a good rental market can mean any rental income from your tenants can produce income for you, aside from your regular business revenue. As mentioned earlier, you’ll also be earning equity and ownership rights of your own building, which is a tangible asset you can sell later or keep and enjoy rental income after your small business is sold. You can potentially take advantage of selling your business and setting up a plan for your retirement if you chose to go that route. When you buy instead of rent office space, more tax deductions are also likely to be available to you, although you’ll want to talk to your tax professional about the particulars for your area and circumstances before making any purchase. You’ll also have control over the CAM fees, tenant lease terms and the kinds of tenants you want for your building, giving you a lot more control over your building neighbors. If you buy an office building, you’re fairly locked into the purchase. Of course you can always sell, but selling can take a lot of time and be subject to terms and conditions that could make it potentially challenging to get out of down the road. If you’re an established business with some historical data to go off of concerning your rental history, your income history and your market cycles, you’ll be better prepared to weather any market fluctuations for both your business and the office space, as losing a tenant will mean lost income for you as the building owner. Also, when you own a business, proper management is essential. You’ll be the landlord screening tenants and dealing with tenant issues, problems and maintenance. So consider the time and effort that will take away from your regular business operation time, or consider the cost and expense of hiring an experienced building manager to do this for you. Before you make the decision to buy commercial property, consider whether downsizing or upsizing in a few years may be an option. You should evaluate what your needs may be before you make the decision to buy office space. Think long term, at least ten to fifteen years out, and make sure that you’re planning to still be in business and leasing your office space.